Agua Hedionda means "stinking water" in English. The name is supposed to have been given the area by the first Spanish explorers. The odor they reported might have come from a nearby Indian village, a sulphur spring, or possibly from decayed matter on the shores of the lagoon. Don Juan María Marrón ruled Rancho Agua Hedionda in the 1840s. His 13,311 acres extended from the Pacific Ocean inland almost to Vista and from Carlsbad south of Encina Canyon. Don Juan had been a ship's captain before coming to San Diego in the early 1820s. He soon became prominent politically and married Doña Felipa, daughter of Juan María Osuna, the first alcalde of the pueblo of San Diego and the owner of Rancho San Dieguito. Rancho Agua Hedionda was granted to Marrón in 1842. Original diseño supporting claim to the land. "One morning, along the road from the mission, came Alcade Juan María Marrón, husband of Felipa Osuna, carrying a white flag. He wanted to visit his wife. Capt. Miguel de Pedroena took him into custody, but Commodore Robert F. Stockton finally gave Felipa and her husband a pass through the lines, to go to their rancho. With their children they walked all the way to San Luis Rey Mission, where another band of Californios seized them and threatened to shoot Marrón for having collaborated with the Americans. They released him but stripped his Agua Hedionda Rancho of horses and cattle." Several adobe homes were built on the rancho by members of the Marrón family through the years. Most of the strutures have disappeared, but several were incorporated into modern residences. One of these was the home of Carroll R. Kelly, whose grandfather was Matthew Kelly Sr., brother of the fourth owner of the rancho. Carroll Kelly farmed and raised cattle on the rancho for thirty-five years. In 1958 he rebuilt the house where Don Juan lived, reinforcing the twenty-six-inch walls and constructing additional wings along the foundation lines laid out by the original owner. Another ancient adobe built by Juan María Marrón, grandson of the original grantee, was in ruins in 1968 but several of its walls were still standing. It was on the north side of Highway 78 less than a mile east of El Camino Real intersection, in a grove of pepper and eucalyptus trees. This property was owned by the Steiger family of Oceanside. John A. Steiger, a realtor, said his grandfather started making the bricks for the house about 1895. His mother, Mrs. Laura Steiger, lived in the adobe as a child. Steiger's grandmother was Doña Lorenza Serrano de Marró, a direct descendant of José Antonio Serrano, grantee of Rancho Pauma. On the south side of Highway 78, nearby, was the adobe home of Silvestre Marrón, brother of Don Juan. Two walls were all that remained of it in 1968. Don Juan María Marrón died in 1853 at the age of forty-five; his widow and four children inherited Rancho Agua Hedionda, with the exception of 360 acres bequeathed to Silvestre. The latter also was given grazing rights on all of the huge rancho. The Marróns leased Rancho Agua Hedionda to Francis Hinton in 1860 for a loan of $6000, with José Marrón and José María Estudillo retaining the right to come and gather salt from the lagoons for their families. In 1865, Hinton assumed ownership of the rancho. Six thousand dollars seems a small price for land worth millions today, but it was considered fair at that time, as drought had laid waste to thousands of acres of grazing land and there was no market for the starving cattle. Hinton was born in New York in 1818. His real name was Abraham Ten Eyck de Witt Hornbeck. When he was twenty-seven years old he changed his name, joined the Army and served throughout the Mexican War. He was a supply sergeant of Company A, 1st U.S. Dragoons. Cave Couts, later to become owner of Rancho Guajome, was a lieutenant in the same unit. Both Hinton and Couts came to California with the Boundary Commission guard. Hinton died at the rancho in 1870. He had never been married and willed Agua Hedionda to his mayordomo, Robert Kelly, who also was a bachelor. Kelly had been mayordomo of Jamacha Rancho on the Sweetwater River and also a merchant in San Diego. He died in 1890, leaving Rancho Agua Hedionda to his nine nephews and nieces, children of his brother, Matthew Kelly. The last of these heirs, William Sherman Kelly, died on May 10, 1950, at the age of eighty-five. Holdings of his son, Allan, 820 acres of the Marrón grant, included the upper part of Agua Hedionda Lagoon. From Allan Kelly's home can be seen the lagoon into which empties the creek of the same name, the Encina power plant and the ocean. In the distance to the south is Palomar Airport which had been carved out of the original land grant. Within the same boundaries are two high hills, or mountains, which on county maps bear the historic names of Mount Kelly and Mount Hinton. Although Matthew Kelly Sr. never owned Rancho Agua Hedionda, he lived on adjacent patented land, Rancho Los Quiotes, until his death. The Kelly heirs in 1922 sold Los Quiotes to a San Francisco syndicate, from which Leo Carrillo, movie actor, purchased the ranch in 1938. Carrillo died in 1961, leaving the property, 840 acres, to his adopted daughter, Mrs. Marie Antoinette Carrillo Delpy. The actor had remodeled the old two-story Kelly adobe ranchouse and made it into a modern showplace. 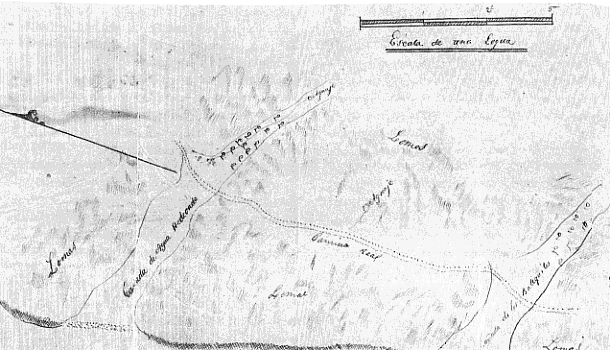 More information on Don Juan María Marrón and Rancho Agua Hedionda on Virginia Debley's web page. Source: Historic Ranchos of San Diego (Union-Tribune Publishing Co., 1969) by Cecil C. Moyer (1899-1981). Richard F. Pourade (1908-1981), Editor.